Wow, I would've loved this as a little girl! 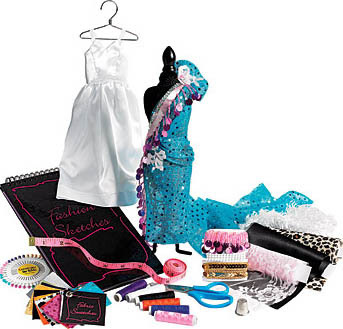 This kit includes 6 yards of fabric, a 12" padded mannequin, a sketch pad, a fabric swatch booklet, five types of trim, six spools of thread, a basic satin dress that can be transformed into a ball gown, an instruction booklet filled with project ideas, and more. What a great gift for your favorite, fashionable, little girl!